Enter Aquaponics; the seamless integration of both the culture of fish (Aquaculture) and the culture of vegetation lacking soil (Hydroponics). This integration yields an agricultural system that bears fruit in different climatic regions. Having that in mind, Eco Built Aquaponics is organic gardening where fish is reared and plants are produced in an integrated prefabricated system devoid of productive soil. Eco Built Aquaponics reduce labor and provide a high standard of food that is incredibly sustainable! Eco Built Aquaponics are prefab systems that provide ready-made solutions that allow for sustainable production of organic food and aquatic life. Our Aquaponics tanks are made of non poisonous and environmental friendly materials. This is essential to allow for the flourishing of bacteria. A proper balance of bacteria in turn leads to the proliferation in the numbers of fish. The waste of fish in turn spurs the growth of vegetation. This completes a cycle of a mutually beneficial symbiotic relationship in the Aquaponics between fish and natural plant. 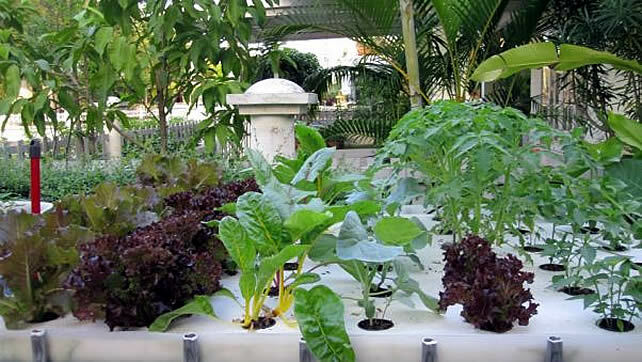 A Eco Built Aquaponics System has the promise of a bountiful vegetable and fruit harvest devoid of pollutants. Secondary agricultural products such as earth worms and bio fuels churned by the system can be sold or used for farming. Farmers are empowered to produce abundant local produce (up to ten times more output) using significantly less water (less than 90% compared to conventional farming). Saves up to 98% of water currently used in normal farming methods! Promises absolutely no use of chemical fertilizers! Eliminates parasitic life for both aquatic and plant life! Offers a solution that useful to people in almost all climatic regions! Significantly cuts on the time, money and labor through the stages of production! Allows for optimal farming regardless of the type of soil of a region! Creats useful by-products that can be used to produce more agricultural produce and renewable energy! Applies to all kinds of settings! Enables year round farming without climatic limitations! Comes to the aid of endangered plant and aquatic species if used for restorative farming!